A unique twist on the dessert cookie that has pepperoni and ricotta, these Pepperoni Pizza Macaron are sure to be a conversation starter no matter where they’re served. Mom was in town for a whirlwind day and a half. Luckily, I have a great boss who gave me the time off and I have an AMAZING husband who changed his Thursday so I could spend more time with Mom. Can I just say, it still seems weird to say, “husband?” S and I have been together longer than any other relationship I’ve ever had. It just seems weird still to say that. I love him dearly and wouldn’t want to spend the rest of my life with anyone else. Okay. Sappy love stuff out of the way. These Pepperoni Pizza Macaron are the fruits of mine and Mom’s labors. Yeah, I hear ya, Mom! You were there and helped whether you believe me or not! While Mom was here, we went to the Degas/Cassatt exhibit at the National Gallery of Art. It was amazing! I had no idea that they were such close friends and that Degas helped Mary Cassatt actually work on the back for girl in the blue chair! Just…WOW! That’s all I have to say. Then we stopped into the Wyeth exhibit. It was just next door. Yes. To say I am spoiled living here is an understatement. There are so many free things to do and see here. The flower was in the planter outside of the gallery. I’ve been wanting to try some savory macaron, but just never quite got there. With Mom here, it was the inspiration I needed to jump in a whip up some crazy savory combination. Since I had tomato powder and didn’t want to go with the typical tomato basil combination, I search the net a bit and stumbled on a macaron pizza party. But the macaron weren’t pizza flavored, they just looked like tomatoes. I think they were strawberry or something. But that got me thinking! Why not? What kind of filling though….hmm…. I was initially thinking of tomato something with a whipped feta center or goat cheese, but Mom said those weren’t her favorite cheese flavors. Okay…what goes with pizza? Mozzarella? Can’t whip it. RICOTTA! You can whip that!! So off I went looking for inspirations of a ricotta buttercream or something along those lines. And thus, Pepperoni Pizza Macaron was born! I knew that the Pizza Seasoning from Penzeys wouldn’t quite be enough. So, why not put a piece of pepperoni on the macaron? It’s the PERFECT size and shape for just such a thing! We hit the store for some items for the macaron, mainly the ricotta and the pepperoni, and then got to work. I whipped up that batch and the second, more traditional batch, of shells. While the second batch was resting, I whipped the ricotta and we sampled some of our fruits before heading to meet L. I assembled a few for us to taste before heading to L’s. WOW! I can’t believe how amazing these tasted!! We took her some of the pistachio ones and the tomato ones. We headed back home for me to pack up some of the sweet macaron that we made and then the rest of the pistachio ones for the DSD and then she was on her way. Hopefully, S and I can arrange it to visit in January. That’s what she’s suggesting and it does seem feasible. He will have more vacation time to use by that time and it would be a good way to escape the cold winter here. But that’s another story. These macaron are the story here. As strange as they sound, everyone who tasted them said they were surprisingly good. Not what they were expecting at all, which is kind of what we were going for; something different. The salt and seasoning in the ricotta mask the sugar in the shells and the pepperoni just brings that hint of pizza that you really need to bring it all together. I can only hope that this inspires Mom to get in the kitchen and make some of theses fickle cookies. She’s seen the “lava” flow batter and hopefully can recreate it’s consistency. And I hope these will inspire you to think outside the box and create new and unique flavors with these interesting little gems. 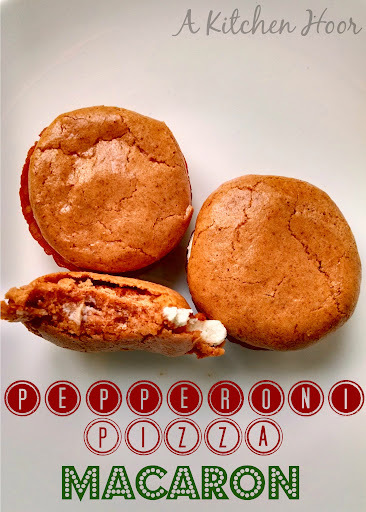 A unique twist on the dessert cookie that has pepperoni and ricotta, these Pepperoni Pizza Macaron are sure to be a conversation starter no matter where they're served. Pulse 1/3 of the powdered sugar, 1/3 of the almond flour, and the tomato powdered together in a food processor to form a fine powder. Sift into a large mixing bowl. Repeat process 2 times more or until all of the powdered sugar and almond meal has been sifted together. Sift two times more and set aside. Place the egg whites in the bowl of a stand mixer. Sprinkle the cream of tartar over the eggs and hand mix the two together with the whisk attachment for the stand mixer. Fasten the whisk attachment and beat the mixture on medium speed until foamy. Slowly add the granulated sugar and beat on medium speed until soft peaks form. Increase the speed to high and beat until stiff peaks form. Sift 1/3 of the almond mixture into the bowl with the meringue. Fold the ingredients together with a large spatula until incorporated. Continue sifting and folding until all the almond mixture is incorporated into the meringue and the mixture should drip slowly off the spatula; like lava flowing. I didn't get it either. It's a slow flow off the spatula that isn't in clumps but a steady, thick flow. Transfer the batter to a large piping bag fitted with a 1/2" tip and pipe 1 1/3 inch rounds onto a silpat covered baking sheet. There are several different templates out there here and here are two I like. You're going to LOVE this next part! Once all the batter has been piped or your sheets are full, grab the edges of the pan, secure the silpat with your thumbs (or any extra batter) and rap the pans on the counter. This releases any remaining air bubbles in the meringue. Continue rapping the sheets, turning occasionally, until no more air bubbles surface. Allow the macaron to rest on the counter at least 30 minutes. Once they've rested and the tops are no longer sticky to the touch, bake at 325 for 9 to 10. Do the "wiggle" test. Grab a top and gently try to wiggle it back and forth. If it wiggles easily, then continue to cook in 5 minute intervals until it no longer wiggles. Remove from heat and cool completely. Place the ricotta in a fine strainer lined with cheesecloth, coffee filters, or paper towels. Allow to set 5 to 10 minutes. Add to the bowl of a stand mixer fitted with the whisk attachment and beat on high 2 to 3 minutes. Add the butter and half and half and process until smooth and creamy; about 5 to 10 minutes. Add the pizza seasoning and salt and stir until blended. Place the cheese mixture into a piping bag fitted with a plain tip and pipe and small dot on one shell and a quarter size amount on the second shell. Place the pepperoni on the small dot on one shell and then place the second shell on top. Serve immediately. Well, you've done it again, you macaron master, you. This is probably weird (which is usually the best indication to keep quiet, but I'll say it anyway), the stack of three macarons…it cracks me up because it reminds me of those wind-up chattering teeth toys with the big smiles. What a creative recipe! Yum! Thanks for hosting it, Jess! They were FUN to make and eat! I have started following you now… as we struggle through our macaron perfectionist ways… I have never tried a savory macaron. This could be interesting. Are you able to taste the almond through all the flavors? One of my books I use has a whole bunch of savory macarons; I've just been too scared to try them. Angelina, I'm stalking you, too. No, you can't really taste the almond through all the other flavors. They were definitely fun to make and interesting to taste. I can't believe how well received they were and how well they came out and DID taste like pepperoni pizza.